This is a true story. My grandfather, Sam Raichlen (known to all by his nickname “Dear”), loved food like a man possessed. The short list of his favorites included Maryland steamed crabs, lox and eggs, gribenes (chicken cracklings), and his mother-in-law’s chocolate roll. (The latter was for him, perhaps, my great grandmother’s chief virtue.) As much as anyone in my family, it was Dear who inspired me to become a food writer. But as my grandfather lay on his deathbed, his last food request, uttered with some of the last words he spoke on earth, was a hot dog. The Raichlen frank, you see, was no ordinary hot dog. It started with Hebrew National all-beef hot dogs, which my grandfather painstakingly sliced nearly in half lengthwise. He opened them up like a book and seared them in a skillet, browning the inside as well as the exterior. (More crust equals more flavor.) He browned a few bologna slices as well, wrapping them around the hot dog. He butter-toasted the buns (we kept Jewish, not kosher), which he slathered with spicy mustard, and piled sauerkraut and pickles high on top. Now that was a hot dog, and you can understand how it might be a dying man’s last craving. Get the “Dear” Dog recipe. Well, you know Raichlen’s rule: If something tastes good fried, baked, or sautéed, it surely tastes better grilled. Use a first-rate beef hot dog. In my family, tradition calls for Hebrew National. 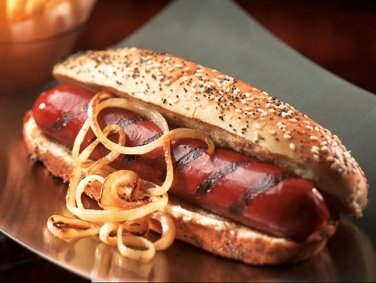 Other good dogs include Nathan’s Famous Beef Franks with Natural Casings, Applegate Organic Uncured Beef Hot Dog, and Niman Ranch Fearless Uncured Beef Franks . Want to really take it over the top? Try an American-style frankfurter from Snake River Farms made with Wagyu beef. Yeah, that’s the same cattle breed responsible for Japan’s kobe beef. When grilling slender hotdogs, lay them parallel to the bars of the grate. This keeps them from rolling, so you can brown on all sides. Work over a screaming hot fire and brown and blister the casing on all sides. For fatter dogs, slice them almost in half lengthwise and open like a book. Grill flat on both sides, giving the dogs a quarter turn after a minute or two to lay on a crosshatch of grill marks. This gives you more surface area to expose to the smoke and fire. Don’t forget a great bun. Our default buns are the fresh baked ones at our local craft bakery. Second choice, fresh baked buns from a supermarket bakery. Plastic packed bread section buns only as a last resort (there’s a reason they last forever). Said buns should be brushed with melted butter and toasted on the grill with the hot dogs (put them on when the hot dogs are almost done). Toasted bread has more flavor and texture. Darkly toasted bread has even more flavor and texture. Just don’t burn it. 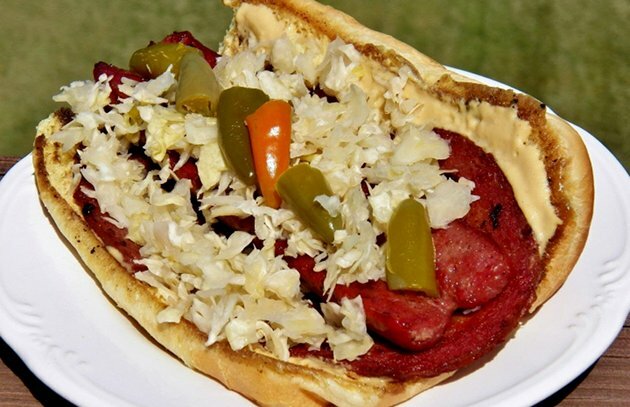 For me, a hot dog is not complete without sauerkraut. Drain it well so it doesn’t make the bun soggy. In my opinion, Dijon-style mustard (smooth) or Maille-style mustard (grainy) has a lot more class than lurid yellow ballpark-style mustard. But this is a personal choice. Want to kick up the heat? Substitute pickled jalapeños for the pickles.